612 Riverside taught us how to make this fantastic Beeswax Collage. KoJo Designs made this Little Guy Tie that is possibly the cutest thing I've seen all week. 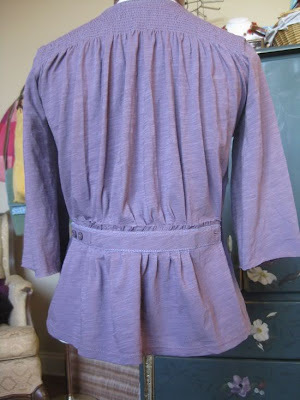 Lori from Waterstone Jewelry created a Fitted Jacket from a boxy cut in a super simple way. 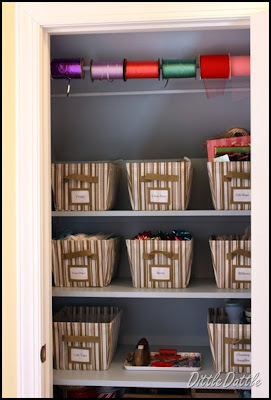 Diddle Daddle made a Gift Wrap Closet that has me scurrying around rearranging my own closets for extra space! And finally, get out that Easter ham bone, because Janet will teach you a great recipe for soup. Congratulations to I Heart Naptime for this week's win! I will put you in contact with Lauren from Utopia Invitations for your $50 gift certificate. If you didn't win this week, you can receive a 10% coupon for Utopian Invitations by clicking here. These are really great ideas! I just adore the little boy's tie! Ooh - I'm totally going to have to check these out! Especially that gift wrap closet. Except then I would have to clean out a closet, because mine all look like an excerpt from Hoarders only without the dead cats and animal feces. Probably. Sorry about the double comment. Or, my comments are just twice as awesome as everyone else's. Your call. Of course it counts if you followed me before the giveaway started :) I entered you! WHAT??! I just gave my hambone to my dad yesterday!!!!!!!!!!!!!!! I just wanted to thank you for hosting such a nice Tuesday Meme, and thank you for signing up to follow my blog. Hope you enjoy your visits. Hey! I just noticed this - THAT's where all my visits came from. lol. Thanks for the feature.